So, my closest yarn shop is about 40 minutes away over in Pennsylvania. It’s a cute little place on the square, all the fiber smells like handmade soap when you take it home (since she sells handmade soap). Unfortunately it is closing at the end of the year. If I had $30,000, a storefront, and lots o’ time – I would buy her business. And if this opportunity comes up again in 5-10 years, I will. But now it’s just not the right time. I’m only 21. Mostly I need more life experience and more knitting/spinning experience. It’ll happen some day. This weekend we stopped in, since I hadn’t been over there for a few months (probably one of the reasons she’s closing, eh?). The drive was beautiful. The hills were covered in trees of all colors, the sun was out, the temperature was mild. It couldn’t have been better. She was having a sale on cotton yarn, which I have no use for at all. 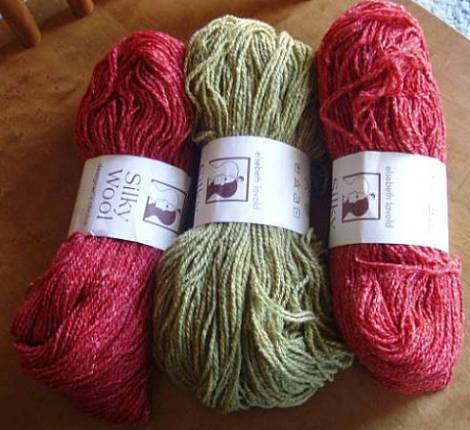 Instead I picked up a couple skeins of Silky Wool, just ‘cuz. I love the way it smells, the silk part especially. It reminds me of Pennsic. I had a skein of the green already, so I thought I’d get a few more so I could actually do something. However, the greens are NOT the same dye lot, they may not even be the same color. But they’re different enough that I think all together it could work. What am I going to do with it? I don’t know. Tonight Richard helped me wind some yarn into balls (or would it be cakes?). He’s the best swift I could find. I love using my nostepinne way more than a clackety ball winder, which I have and never use. He bought the nostepinne for me last Christmas and it has become one of my favorite tools. It’s wooden, so it looks nice; it’s portable; it’s historical; it’s hands-on and controllable. Anyway, the yarn was Harrisville Tweed which I intend to turn into a Cosy Train Tam. It’s finer than worsted, so I think I’ll hold two strands together through-out. Maybe if I get all my homework done early tomorrow I’ll reward myself by starting it. Previous Previous post: spins like butter.